Government publications go beyond books and pamphlets – there are some great magazines out there, like Humanities, published by the National Endowment for the Humanities. Every time I pick up an issue, I mentally kick myself for not doing so more often. Take the November- December 2010 issue, for example. It’s just coincidence that I looked at this issue at the beginning of Black History Month, but I’m glad I did. 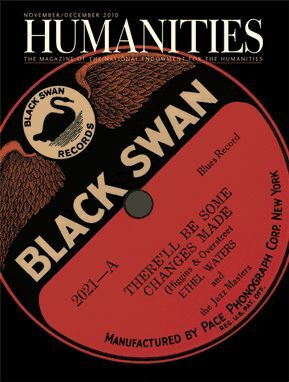 The cover article, “Black Swan Rising,” tells the remarkable story of Black Swan Records, which from 1921 to 1924 was the first major black-owned record label, and one that recorded black classical music and spirituals as well as jazz and blues. It was conceived by Harry Pace, a protégé of W.E.B. Du Bois, who also sat on Black Swan’s board of directors. William Grant Still, later an important composer, was the label’s in-house arranger and the great Fletcher Henderson, who contributed so much to jazz in the 1920s and 1930s, was the recording manager. Named after Elizabeth Taylor Greenfield, also known as “the Black Swan,” the 19th century’s most accomplished African American concert singer, Black Swan Records was established to display the broad scope of contemporary black music of all kinds while demonstrating the entrepreneurial skills of African American businessmen. In its brief history, the label issued recordings of spirituals, arias, Christmas carols, and the first recorded performance of “Lift Every Voice and Sing.” Black Swan also had hit blues records by Ethel Waters, Alberta Hunter, and Trixie Smith. The growing popularity of radio – the “new media” threat of its day – an overly ambitious capital expansion, and competition from other record companies led Black Swan to sell out to Paramount Records in 1924. Even before then, the need for inexpensive material led the label to issue recordings by white jazz and pop artists under “black” pseudonyms – and apparently no one noticed. “Black Swan Rising” is just one among many terrific articles in this issue. Other topics covered include the Buddhist caves of Xiangtangshan, Founding Father George Mason, the Fort Shaw Indian School girls’ basketball team, and much more. You can read “Black Swan Rising” here, get a subscription to Humanities here, or find it in a library. I’ll be blogging about this great periodical again soon because it’s really an amazing resource – and who could resist an article that tells the story of Sir Isaac Newton’s lifelong infatuation with alchemy! This entry was posted on Monday, February 7th, 2011 at 3:49 pm and is filed under National Endowment for the Humanities. You can follow any responses to this entry through the RSS 2.0 feed. You can leave a response, or trackback from your own site. I LIKE VERY MUCH THIS STORY!ACTUALLY THE STORY OF “BLACK SWAN RECORDS” IS REMARKABLE!IN ADDITION THE AMERICAN JAZZ MUSIC HAS AN OWN COLOR!AND ANY KIND OF MUSIC HAS THE OWN HISTORY!FROM THE HISTORY OF EVERY KIND OF MUSIC WE CAN GET MANY IMPORTANT INFORMATIONS!THESE INFORMATIONS ARE RELATED TO THE CULTURE OF ALL PEOPLE!…AS FAR AS I AM CONCERNED , I LIKE THE BLUES! The blues are the best!